Shannon Lucio wears red and green low top Converse “Chuck Taylor” All Stars in the film. Riley Smith wears natural white high top Converse “Chuck Taylor” All Stars in the film. Chauncey, Carl, and Polly have breakfast at the Jenkins home. Any a graduation is a monumental moment in a person’s life. Be it from middle school, high school, college, or even a trade school, graduations mark the end of one part of life and the beginning of a whole new chapter. For some they’re sad moments and for others they’re happy. Many films in the teen genre have tackled high school graduations and the multitude of emotions that go with it. Some go the comedic route, others down a much more serious path. The aptly titled Graduation attempts to mix both aspects into a teen-heist film that falls flat on its lofty aspirations. The seniors at Hollis Hills High School must pass Mr. Ryerson’s difficult biology final to graduate. In suburban Pittsburgh, four high school friends are on the brink of graduating. Carl Jenkins (Chris Marquette), Polly Deeley (Shannon Lucio), Chauncey Boyd (Riley Smith) and Tom Jackson (Chris Lowell) might all be nearing the end of high school but they’re at vastly different places in their lives. Carl’s mother has cancer, Polly is going to Harvard, Tom’s lost and Chauncey just wants to stay together with Polly. After finding out about Carl’s mom, Polly suggests they rob her adulterous father’s (Adam Arkin) bank. Having worked there the last few summers, Polly knows the ins and outs of the bank, and just how to lure the security guard away. The four decide on using their graduation ceremony as the perfect cover. Yet as they plan for the heist, things get complicated. Carl falls in love with a teller, Polly has feelings for Tom Jackson, with the heist ultimately devolving into a hostage crisis. Polly, Carl, Chauncey, and Tom plot a bank robbery to help Mrs. Jenkins get the surgery she needs. Graduation doesn’t really know what it is, or what it wants to be. The film is a juxtaposition of genres all lumped into one, seemingly mundane high school “dramedy” film. There’s elements of teen comedy, drama, a little heist film, and even some romantic elements. Some of these juxtapose genres land. Like in the American Pie films or a John Hughes picture, “dramedy” works in the high school setting. Yet with this film, there’s just too much going on. At one point you are laughing (or pretending to), and the next you are watching someone fall in love and get their feelings hurt. The heist aspect of the film also doesn’t really need to be there. It’s more of a plot device, and the fact that it’s used as a learning point for these kids is odd. The four friends go to the bank at night to test out their plan. While a seemingly “innocent” heist film could have worked here, having one involving firearms and a hostage is not the right vehicle. The fact that the characters learn more about themselves during a robbery with deadly weapons than through the typical high school means is just forced. Sure, it is a movie and we shouldn’t take this film for documentary realism. But, having these kids find themselves through taking a nod from Resevoir Dogs isn’t the best idea. Coupled with one-dimensional characters that are high-school tropes, Graduation does nothing to make one long for the long summers of high school and the hopes of that new chapter in one’s life. Polly’s relationship with her father, Dean, becomes a lot more complicated..
Polly and Chauncey are figuring things. Chucks make a few appearances in the film as Polly sports a pair of red or light green low tops in various scenes. Chauncey also wears natural white high top chucks in a few of his scenes. 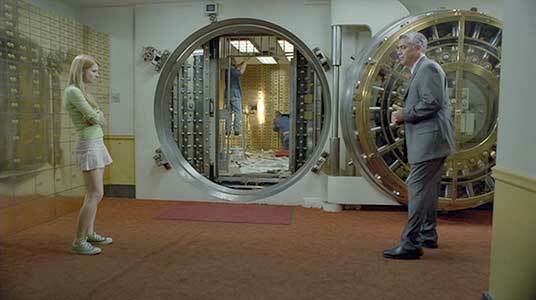 The best scene sequence is when the four are inside the bank, scouting things out before their heist/graduation day. The bank robbery plan will take precision timing to pull off. Graduation. (2007) Shannon Lucio, Riley Smith, Chris Marquette, Chris Lowell, Huey Lewis, Adam Arkin. Written and directed by Michael Mayer. Categories: Teenagers, Crime.